So even though we moved into our Toronto apartment in May it’s been slow going as far as decorating is considered. I managed to fight for the living room to get basically finished (minus details that have to wait until we win a lottery or at least can buy name brand flour) but the bedroom has been pretty low on the priority list. This past Sunday was the first day when I wasn’t working and we didn’t have any obligations to get to. It’s been such a busy summer with family dinners and birthday parties that we haven’t really had a day just to ourselves at home. Of course I seized that opportunity to put Justin to work. He’d been pretty against putting up more pictures (I’m a big fan of frame collages, so you can imagine how many he’s already put up in the living room/entry way alone) since all the walls in this apartment are concrete. It’s pretty tiring work to get through it. We set aside Sunday to get the bedroom more or less finished. Of course in the way of the decorating powers that be, it turned out that after the months of waiting to find a day where we could devote the time necessary to drill through concrete, the wall I wanted the pictures on in the bedroom was the only wall NOT made of concrete. The whole thing took 10 minutes. 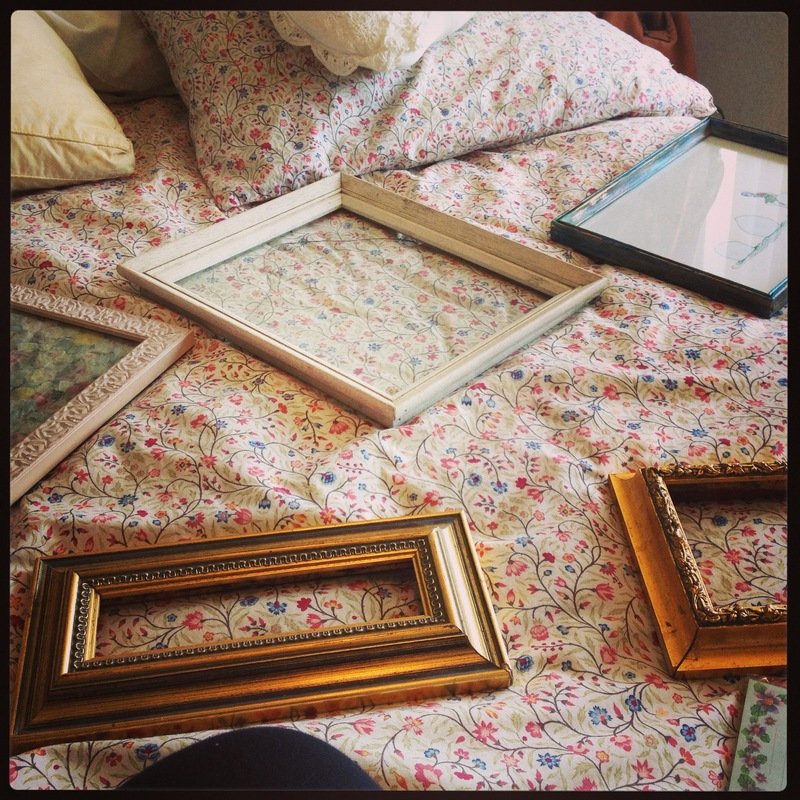 This is one of the posts we moved over from our laceandloveletters blog and I received a few questions about where I sourced all these frames from. I never got around to explaining on the old blog and this is the last post to come over I think so I figured it was as good a time as any! 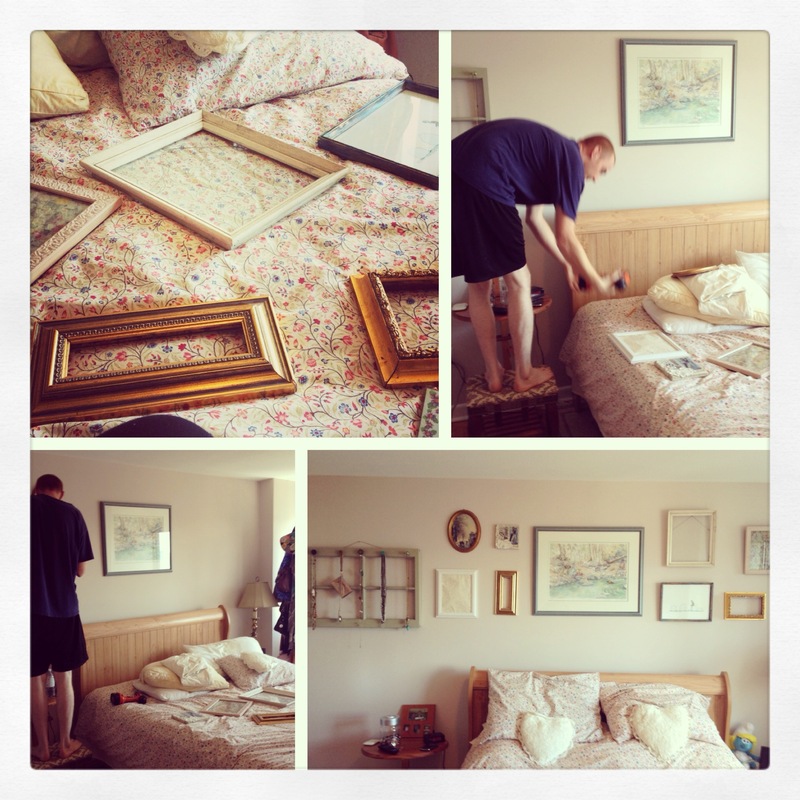 Some tips on where you can find frames and DIY projects that will make your space shine! 1. The big picture hanging in the middle as the anchor for the collage is a gorgeous fairytale-esque print I’ve had since I was little. I don’t actually know where it’s from but its called Amara’s Playground by Martha Shultz. 2. These three pictures as well as the three on the right side of the anchor (number 6) were found at a thrift store. My roommate in university and I spent about $10 on a whole box of random frames that we collaged in our shared bedroom and then just picked our favourites when we moved out. I’ve lugged these frames from place to place about three moves since then, but I just love them. A couple of them I framed some old tissue paper or scrapbook paper I had lying around, and some I just left empty because I thought it looked romantic. 3. This little one is actually so precious to me because one of my friends made it in art school. 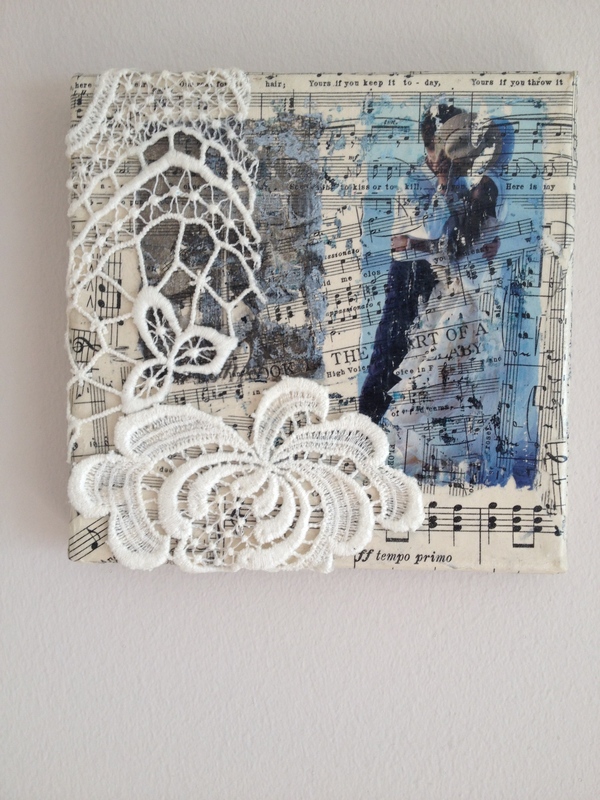 It’s hard to tell from the picture but its a canvas covered in a sheet of music from a love song with an image of a couple paper mached and lace overtop. It’s so sweet I love it. 4. This is actually a DIY I keep meaning to post but forget all the time. 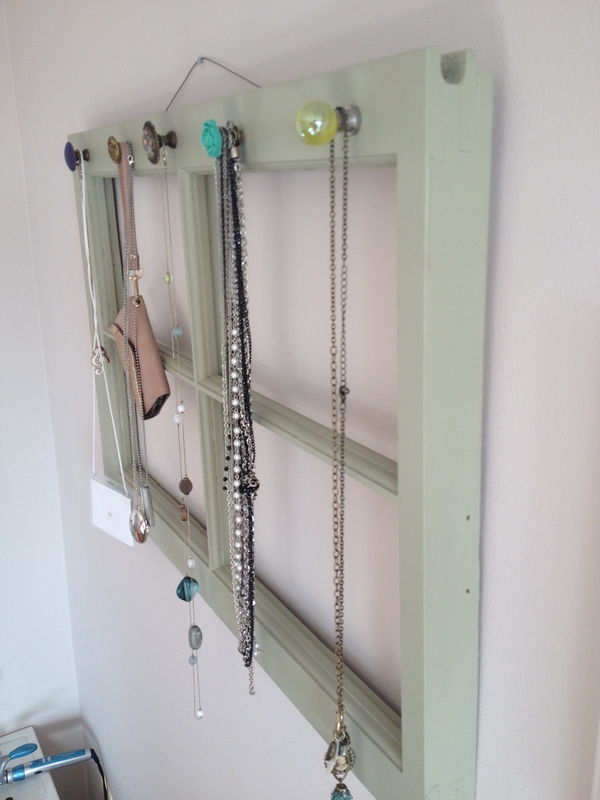 It’s an old window that I sanded and painted and turned into a necklace holder. The necklaces hang from some drawer pulls that I found by a really talented artist on Etsy. I promise I’ll get to that DIY soon! 5. 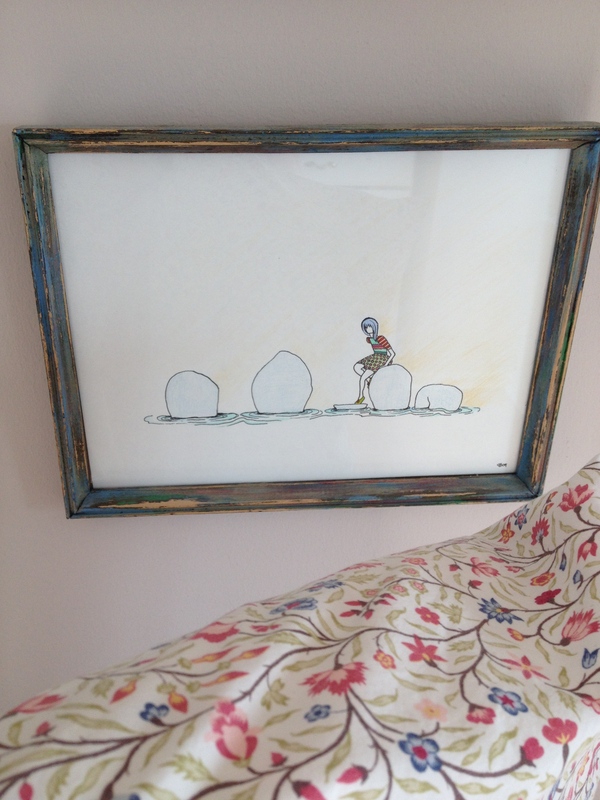 This gorgeous print is a really simple drawing of a girl sitting on some rocks in the water. It’s done in a cartoon style but it’s actually beautiful. My boss from my first serious summer job bought it for me as a going away present because it was done by a local artist and was in our gift shop and I just craved it all summer long. It’s framed in this really classic rough frame that for some reason I am obsessed with. It’s one of the nicest things I own and has some really special memories from that summer so I love being able to use it here. 6. These frames are a few more from that fateful thrift store box. It’s nice to have these little frames lying around and every time I see them I’m reminded of decorating our university bedroom together which is a fun sentiment to have hanging around. Our bedroom here gets a lot of natural light which our old apartment in Ottawa wasn’t as fortunate to get (probably due to being about 20 floors higher in Toronto than we were in Ottawa; less buildings to block the light) and the walls are painted this soft mauve colour. Justin is the best ever and let me keep my floral university duvet so now I think the bedroom looks so soft and romantic. Plus we scored this amazing queen sized wood sleigh bed my parents were getting rid of and it looks so gorgeous in here. It’s definitely one of my favourite rooms in the apartment!